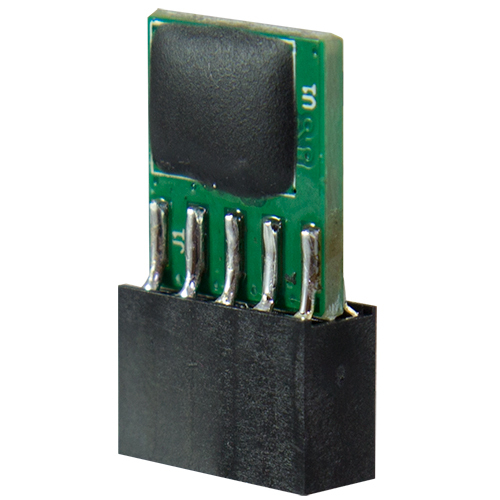 Tiny and compact, the new CmStick/IV for the internal USB interface. Wibu-Systems announces for the first time the new CmStick/IV (where IV stands for “Internal Vertical”) at SPS IPC Drives 2013, booth 640, hall 7. The new CodeMeter hardware protection device with 2x5 pins and 2.54 mm pitch can be space-saving when connected upright directly to the USB port on the motherboard of an IPC or embedded system. Like all other CodeMeter dongles, the CmStick/IV contains a smart card chip to execute cryptographic functions and secure key storage. CodeMeter realizes integrity protection, know-how protection as well as flexible licensing of software and data. The CmStick/IV broadens the lineup of the CmStick/I, in the standard form factor of a USB flash drive module with a 2.54 mm pitch socket, and the more compact CmStick/CI with a 2.0mm pitch one. These internal USB interfaced CmSticks are available with an extended environment temperature range comprised between -25ºC and +85ºC, increased ESD immunity and optional conformal coating for condensing humidity. Customized versions can be produced at short notice.